The first Boise City Council meeting of 2006 looked more like a 60’s love-in than new millennium meeting of hard boiled politicians. Lots of hugs and kisses as Jerome Mapp said his farewells and just as many as Councilors Vern Bisterfeldt and Maryanne Jordan took their oaths of office. Former councilor Mike Wetherell, dressed in his black 4th District Judge robe, administered the oaths to Jordan and newly elected Jim Tibbs. Bisterfeldt asked that county clerk Dave Navarro do the honors for him–as he did when Bisterfeldt was elected to the Ada County Commission. Everyone said nice things about each other and the audience was responsive with prolonged applause and standing ovations. 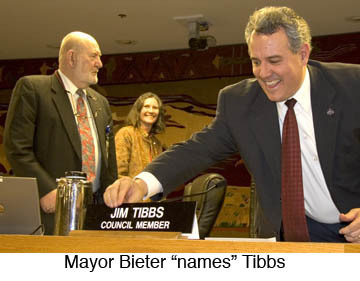 Perhaps the most telling and least noticed moment of poetic justice came when Mayor Dave Bieter graciously installed TIBBS’ nameplate at the end of the dais–this after Bieter had declined to give Tibbs the nod as police chief. Sometimes one has to eat a bit of crow. Salt Pepper any one? At least he appeared to do it with some class.